I am so excited to share pictures of my new Fricaine handbag with you! I own one other bag from Fricaine; I carry it daily and it shows no wear at all. Everywhere I go, people comment on how beautiful it is. This Fricaine Lagosian Satchel is sure to get the same attention. The Lagosian Satchel features a gorgeous quilted exterior design. The fabric is 100% cotton printed by using a special wax printing technology. Four different patterns make up the quilted squares. It's accented with beautiful high-quality synthetic leather and gold-plated forged hardware that never corrodes. I carefully looked over every single inch of the bag and it's perfect. Every stitch, every inch of fabric, everything about it, is painstakingly created. I absolutely love the Lagosian Satchel! There is an exterior zipper pocket where I keep my keys so I can easily find them. The custom-made interior fabric perfectly complements and contrasts the exterior. There are two big roomy compartments, plus two zipper pockets and two open pockets (one perfectly sized for my smartphone). There is more than enough room for everything a lady carries in her bag! Fricaine even put thought into the bottom of the bag. By adding hardware buttons, it protects the Lagosian Satchel when I have to set it down on the floor somewhere. The zippers all work perfectly without having to tug at them. The Lagosian Satchel also comes with a shoulder strap that I can attach to the two hardware rings, making it into a shoulder bag. I usually prefer to carry it on my arm, but when I'm traveling it's nice to have the shoulder strap to free up my arms. I love this bag! Buy the Lagosian Satchel HERE. Go check out all the gorgeous handbags at www.fricaine.com. Choose from their many exotic colors, prints, and designs for a statement piece that's more like a work of art than a handbag. Be sure to follow them on Facebook, Twitter, Pinterest, and Instagram so you're first to hear about special sales and new designs! 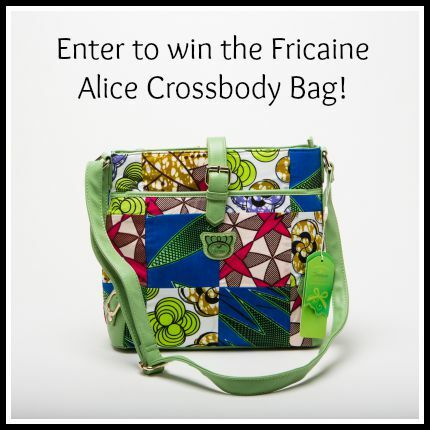 Win the Fricaine Alice Crossbody Bag! To enter, just fill in the giveaway form below. Open to US residents, ages 18 and older. By entering this giveaway, you will be providing your name and email to Fricaine. Giveaway ends on 8/15/2015. Good luck! Disclosure: I received product at no charge from Colgate-Palmolive in exchange for my honest review. If you've read my blog for a while, you know I'm a huge fan of Softsoap Body Washes. I get so excited when each new season's limited edition scents are released. I've just received the three new summer body wash scents and they are island-inspired! These scents take me back to the fabulous week I spent on the island of Nevis. Fiji Waves is a light blue color (perfect for my guest bathroom) and is a fabulous combination of the refreshing scents of cucumber and melon. Fiji Waves is a moisture-rich formula that leaves my skin soft, silky, and smooth. Tahitian Glow is like a warm summer sunset, wrapping me in the scents of citrus and pineapple. The moisture-infused formula of this body wash makes my skin feel amazingly soft. The scent of Tahitian Glow lasts on my skin for hours and my dry summertime skin soaks up the moisture. My favorite new scent is the Bali Bliss. The blended scents of coconut and lime take me back to paradise. My skin is left feeling radiant and smooth with Bali Bliss. I can't wait to see what wonderful new Softsoap limited edition body washes come next! Grab these island scents at Walmart before they are gone. Stock up now so that when we're in the thick of winter, you'll have some summer-inspired scents to escape into your own exotic paradise. Chalk Ink wet wipe markers are so much fun to use and they can quickly and easily decorate any non-porous surface. 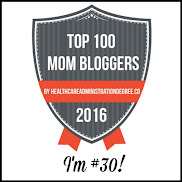 They are fabulous on chalkboards, mirrors, plastic, ceramics, and glass. I received the classic set of eight markers in 6mm chisel top to give them a try. This pack comes with eight bright, beautiful colors and there are 22 more colors available. Chalk Ink markers come in 0.5mm, 1mm, and 15mm. My colors included Chalk White, Clown Nose Red, Piggy Bank Pink, Candy Corn Orange, Smiley Face Yellow, Astroturf Green, Pacific Blue, and Jack Black. I grabbed an old plastic vase from my pantry and decided it was perfect for a Chalk Ink makeover. The neat thing about these markers is that I can clean off the colors easily with water or Windex. If you've ever drooled over those fabulous chalkboard signs at bars and cafes, with Chalk Ink markers you can write bold, beautiful letters too! Using just two Chalk Ink markers, in pink and green, I totally transformed the look of my vase in just a few minutes. The Chalk Ink dries quickly and can even be layered in different colors. What will YOU make with Chalk Ink? Grab your Chalk Ink markers at www.chalkink.com! Follow them on Facebook, Twitter, and Pinterest for more ideas on decorating with Chalk Ink! While I was on the island of Nevis, I stayed at The Hermitage Plantation so it was only natural that I should have breakfast there all week long. One morning, I was offered a glass of cherry juice and the waiter brought me the glass of juice you can see in the picture above. I asked about it since I was expecting a red juice. He told me it is juice made from the fruit of the cashew tree and they call it a cherry in Nevis. I love cashews and didn't even realize the cashew tree fruits could be eaten! It has a wonderful sweet taste and I had two glasses of it! The cashew tree where the fruit was taken for the juice stands just inside the entrance to The Hermitage. I also learned that each cashew fruit only produces one cashew seed. Each seed is then broken open by hand to get to the cashew nut, which is then roasted for us to eat. Eating a cashew seed off the tree is poisonous. The Hermitage restaurant also makes the most delicious yogurt I've ever eaten in my entire life. It's more like a dessert than a breakfast food. On another morning I also tried gooseberry juice for the first time, which was also delicious. They also make a fabulous lemon marmalade, which I spread on wheat toast with butter on several mornings. There were several times throughout my week there, that I saw the wait staff wander into the gardens of The Hermitage to pull fruits off the trees to serve at the next meal. You can't get fresher food than that! The mangoes are plentiful on Nevis, so I had the opportunity to eat them at most of my meals. They are different from the mangoes I buy in my local grocery store in both color and size. The monkeys on the island really enjoy them too. I loved the sweet breads that would come with my fruit too. One of my favorite breakfasts at The Hermitage is the omelet with cheddar cheese and creole sauce. Their creole sauce is amazing! It's the perfect blend of sweet and spicy. Even their coffee was good, and I'm very particular about my coffee. I had the opportunity to chat for a few minutes with Chef Janice at The Hermitage. She is originally from England is a self-taught chef. She lived on St. Kitts, the sister island of Nevis, for 27 years, then moved to Nevis in 2002. Her favorite food to make is appetizers. Her favorite mango dishes to make are salsa and sorbet. She loves working at The Hermitage because of the relaxed environment and the freedom to make whatever she wants depending on what's available at the time. The Hermitage is a fabulous place on the island of Nevis for breakfast! The wait staff is friendly, the service is excellent, and the food is incredible. Check out the cottage where I slept HERE. Giveaway! 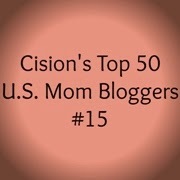 GalsShopper - Five Winners! Disclosure: I received compensation for this post. 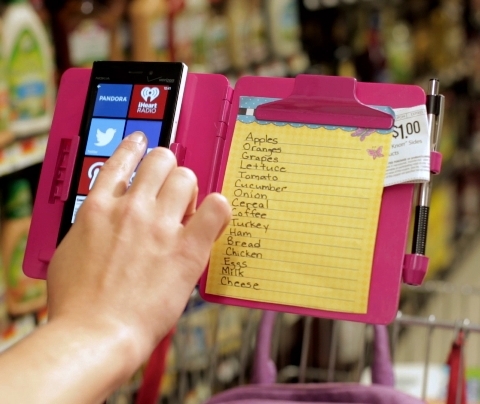 Finally there's a product to make shopping easier and more organized! 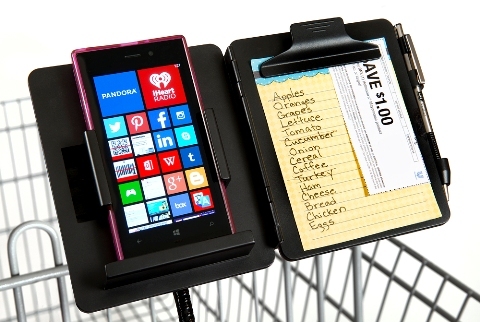 GalsShopper holds your smart phone, shopping list, coupons, and pen all in one convenient place. Right in front of you! Best of all, your GalsShopper comes with you and leaves with you when you shop. Isn't this a fabulous idea? Your GalsShopper clips on and off any shopping cart handlebar or baby stroller handlebar, allowing you and the retailer to gain valuable shopping time. And when you’re done shopping, your GalsShopper fits right in your handbag or vehicle glove compartment. 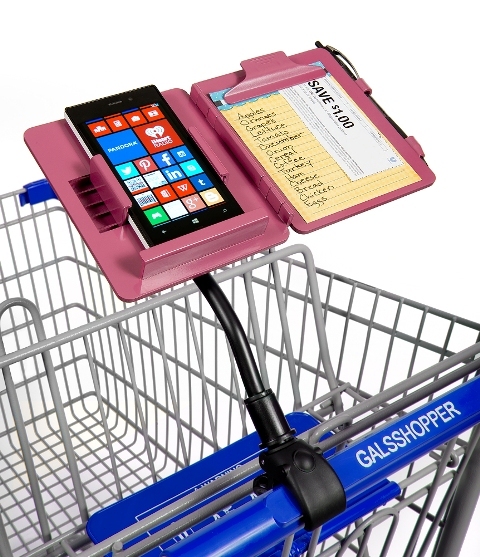 GalsShopper can hold any size and any brand of smartphone. It's the ultimate shopping companion! Order your GalsShopper today at www.galsshopper.com for just $19.99! 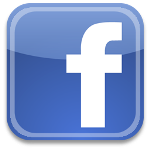 Follow them on Facebook, Twitter, Instagram, and Pinterest! To enter, just fill in the giveaway form below. FIVE winners will get to choose a GalsShopper in either pink or black. Giveaway is open to US residents, ages 18 and older. Giveaway ends on 8/15/2015. Good luck! The luxuriously soft bedding of a beach resort is now available for you to have in your home. Cariloha Resort Bamboo Bed Sheets are incredibly soft and smooth. A beautiful set of queen size sheets in white were waiting for me when I returned home from my travels to the island of Nevis. They were packaged in a fancy storage box, tucked into a storage bag, and wrapped with a ribbon. As I unwrapped the sheet set, I could instantly feel the high quality softness. These Cariloha bed sheets are expertly crafted from 100% bamboo viscose. Bamboo is a sustainable resource since it grows so quickly. It's twice as soft as cotton, is naturally hypoallergenic, is three degrees cooler than cotton and wicks moisture away from your body. This means when you sleep on Cariloha sheets, you're getting quality sleep on dreamy-soft sateen sheets that is also helping to save our planet's resources. I love Cariloha sheets! I washed my set before putting them on the bed. I did not have to iron them and they came out of the dryer as soft as they were when I opened their packaging. The fitted sheet features elastic all the way around the bottom and is deep enough for even the deepest mattresses. Cariloha is so certain you will absolutely love your new sheet set, that they guarantee it or give you your money back. You simply must try them! Shop today for Cariloha Resort Bamboo Bed Sheets at www.cariloha.com. Choose from Queen size or King size in White, Ivory, Shoreline Gray, Graphite, Hawaiian Sand, Island Spa, Blue Lagoon, or Caribbean Mint. Bring the luxury of a beach resort home! Yachtsman Grill is another fabulous restaurant on the island of Nevis that overlooks the Caribbean sea for an amazing sunset dinner. They have a HUGE wine list and their decor is classy and nautical. Chef Scott Higby of Austin was a guest chef and he sure knows how to combine the bold taste of Texas ribs with the sweet taste of Nevis' plentiful mangoes for a delectable dinner. Scott's lovely wife Karina Akhavan, a fabulous pastry chef, crafted the incredible dessert. I dined with two wonderful people from the Nevis Tourism Authority, Devon Liburd and Angelique France. We started with Mango Mahi Ceviche and fresh corn chips. It was both sweet and spicy, sort of like a mango salsa. I also enjoyed a Mango Smoothie Cocktail. Dinner portions were certainly Texas-sized! Chef Scott prepared each of us a half rack of slow-smoked Baby Back Ribs with his Double Secret Mango Barbecue Sauce. I really wish I had that sauce recipe! We also had Mango Cole Slaw, German Potato Salad, and Seasoned Roasted Corn on the Cobb. Everything was absolutely perfect. I could only finish about half of my food! Karina made her Rum Baba (which is a sort of rum-soaked cake) with fresh Mango Ice Cream. Amazing! I had the pleasure of interviewing Scott and Karina earlier in the day and watched some of the preparations for the dinner. There's a whole lot of delicious rum in Karina's Rum Baba! I asked Scott what he felt was the most difficult thing about being a chef in Nevis versus Texas. He laughed and said he knew where everything was at in his kitchen at the Four Seasons Austin. He noted that the chefs in Nevis seemed naturally and independently knowledgeable about running a high quality restaurant kitchen, whereas in America there many more people in the kitchen and more written regulations. All I know is that the food is Nevis is better than just about anything I've eaten in America. Read more about my trip to Nevis HERE! I've finally found the secret to inner peace and tranquility! I've spent several hours over the past couple of days coloring in The One and Only Colouring Books for Adults, The Second One and Only Colouring Book for Adults, and The One and Only Mandala Colouring Book. It is incredibly relaxing! With all the noise in our world from televisions, computers, radios, and traffic, often we find it difficult to unplug and unwind. In our busy lives, we often find it hard to take a needed break from daily life and just relax. Grab your crayons, because these books are the answer! When the mind is focused on a creative project, the analytical side of the brain takes a break. These Colouring Books offer a wide range of beautifully detailed pictures to color, and looking at the patterns and designs is both peaceful and stimulating at the same time. It's been many years since I've sat down to color and I've discovered it's just as much fun now as it was when I was young. I've also realized I still love a brand new box of crayons. Even though I only picked up a box of 24 crayons, now that I'm hooked on these books, I need the big box with the sharpener in the back. It's such a stress-reliever when the only decision I need to make is what color crayon to use next. The rest of the world just melted away for a little while. The One and Only Colouring Book for Adults series is printed on very high quality paper. These would make a fantastic gift for anyone! Do you have any stress or noise in your life? Of course you do! Turn off the tv, walk away from your emails, mute your smart phone, and grab The One and Only Colouring Book for Adults series! 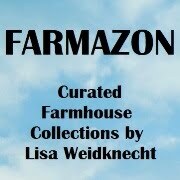 I love these books and I know you will too. There are millions of websites where we can buy products. Some of those websites sell millions of products. That means we have to sift through all those products and take a chance on wasting our money on a new product that we're not so sure is all it's advertised to be. TheGoodz.club offers a select line of lifestyle products for your home, your kitchen, and your nutritional needs, chosen from around the world by a dedicated group of buyers. I recently received two of the products offered by TheGoodz.club to see the quality for myself. I instantly fell in love with this Natural Wineyard Willow Wine Basket from their historic basket collection. It's one of six charming picnic baskets they offer. It's the perfect couples gift and hostess gift! Handmade of natural red willow, the Wine Basket features a soft, comfortable shoulder strap, an old-fashioned toggle closure, and a wood and stainless steel opener that fits into an exterior pocket on the basket. It measures 13.25" tall and 4.75" in diameter, for carrying a bottle of wine to your picnic. I have a lot of baskets in my home (and I mean a LOT) but this one is my favorite! I also received a 10oz bottle of the A La Maison Lotion in Green Tea from their bath and body collection. It's a traditional French formula that contains 100% vegetable oils. It has a delightful, light scent and smooths on easily. My dry skin soaked it up lusciously and my skin was still soft the next day! This lotion is cruelty-free, SLS-free, Paraben-free, and Phthalates-free. The A La Masion Green Tea Lotion goes a long way. This little bit (in my hand below) covered both of my arms from shoulder to fingertips. I really love this lotion and can't wait to try some of the other body products! TheGoodz.club also offers botanicals and herbs, home goods like cleaners and detergents, homeopathic solutions, health supplements, food and beverages, and even products for children and babies. One of their best sellers is Charlie's Soap. Check out their insider prices at thegoodz.club! Right now, first-time Paper Pumpkin subscribers get 50% off the first two months! Go to PaperPumpkin.com and use promo code “HALFOFF” by September 10. And each month, you’ll enjoy a fully designed project kit delivered right to your door with stamps, ink, and paper—everything cut and ready to go. After your first two months, you’ll want to keep the creativity coming for just $19.95 USD/$24.95 CAD + tax per month (shipping included).